San Ysidro/Tijuana Trolley, a photo by Global Greenways on Flickr. South of San Francisco, our trip was full of trains! We rode the SF MUNI streetcar to our craigslist rideshare. She drove us all the way to Pasadena. CicLAvia, Los Angeles’ experiment in a car free Sunday event had occurred the day before and the front page of the Los Angeles Times bragged how, for once, it was easier to bike across town than drive! Pasadena was not a great place to be on foot, with giant avenues, speeding cars, and endless parking lots. Down at the Pasadena Rose Bowl we found where all the pedestrians and bicyclists are hidden! They all drive down to the Rose Bowl to jog & bike around a really nice sidewalk and bike lane loop. We had been confused about the lack of people in Southern California, especially with the perfect weather. But, everyone seemed to be half human/half car hybrids. Escaping L.A. by transit was easier than we expected. 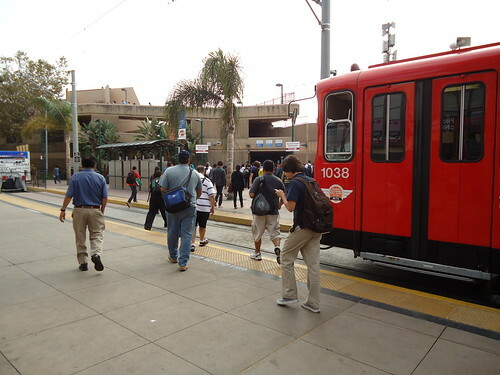 We rode the L.A. Metro Gold Line to the downtown Union Station. The light rail pulled right into the main train yard for Union Station and we began the hunt for how to flee Los Angeles for San Diego. Initially, the Amtak Pacific Surfliner seemed like the intuitive route. We did some research and discovered that it was much more inexpensive to take two commuter trains to San Diego than to ride one Amtrak. So, we hopped on the Metrolink to Oceanside and watched the graffiti and concrete waterways of L.A. disappear into cookie cutter suburbs. The Metrolink dropped us off in Oceanside, next to the sandy beach where surfers bobbed offshore in the waves. We crossed the tracks and boarded the Coaster, which delivered us into downtown San Diego at sunset. San Diego was a much more hopping city than i had remembered. People out and about enjoying the nightlife scene and overflowing restaurant patios crowded the sidewalks. We met some of the local pedicab drivers, who were mostly immigrants pedaling tourists for the summer. The San Diego to San Ysidro trolley runs right through the center of San Diego. We hopped on it and rode through town. Masses of High School students boarded at one stop, flocks of factory workers from the shipyards at another, almost everyone headed to the border crossing. At the end of the line, we stared at the Border. The mystery of Mexico lay beyond. We had traveled from the Canadian Border to the Mexican border by transit and hitchhiking. Now we only had 6000+ miles left to make it to Christmas dinner in Puerto Varas, Chile. Please follow along our journeys and investigations as we share our stories and mobility lessons from Latin America. San Francisco Cycles, a set on Flickr. We rolled into San Francisco as the sun set on the Pacific, outlining cyclists’ shadows on the Golden Gate Bridge. We had managed to ride public buses and hitchhike all the way to the Redwoods from Seattle. There were big gaps in the rural areas around the Bay Area for transit service. We would rely on Craigslist rideshare to later make it to Los Angeles. Our old friend and amazing artist, Mick Larusso offered us a place to rest and some bikes to explore the city. We had a beautiful day of pedaling all over San Francisco! It was one of the last days of Summer, and Fleet Week for the Bay Area. Crowds of people flocked to the shore with necks craned skyward searching for sight of the Blue Angels before their sonic booms arrived. There were many people biking along the waterfront trail and throughout downtown. With all the festivities, driving must have been a real mess. I have not spent much time in California and was real surprised how motorcyclists would aggressively use the bike lanes with arrogance. San Francisco seemed to be lacking safe bike infrastructure and these yahoos with something to prove on their motorcycles did not make you feel safer in the bike lane. Though, the City of San Francisco is working hard to create more safe spaces for cyclists. Within our first moments of being in town, we came across a cycle track style bike lane with green painted pavement and plastic pylons for safety. Lale and i pedaled around the San Francisco Peninsula enjoying the nice breeze and taking in the sights. Pedicab drivers from many companies were super busy along the Embarcadero with Fleet Week guests. Ice Cream vendors with push carts also worked the weekend crowd. This was some of the first street based commerce we had seen since Portland. Along the waterfront, there were bike rental kiosks parked along bike trails. These were just small trailers with a fleet of bikes for rent displayed alongside. In Golden Gate Park, we stumbled across their weekly (?) car free day in the Park. Joggers, cyclists, tourists, and kids all walked, rolled, and played on the main road through the park. Within minutes, the gates must have reopened for cars, and our care free pedaling became stressful and defensive. Overall, it was great to explore San Fransisco by cycle and to experience the city firsthand! 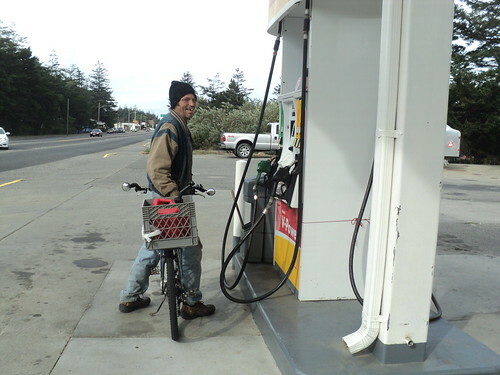 Utility Cycling on the Oregon Coast, a photo by Global Greenways on Flickr. This fellow was the only cargo cyclist we saw on the Pacific Coast until San Francisco. He was working on his vehicle and had pedaled to the gas station for a quick fill. Always a bit of a surprise to leave the Portland bubble and realize the rest of the country is still driving and paying their incomes to oil companies!